Tobias Menzies talks Outlander’s season finale. Peter Capaldi wants Doctor Who’s oldest companion to return. Check out two clips from Terminator Genisys and our best look yet at Batman in Suicide Squad. 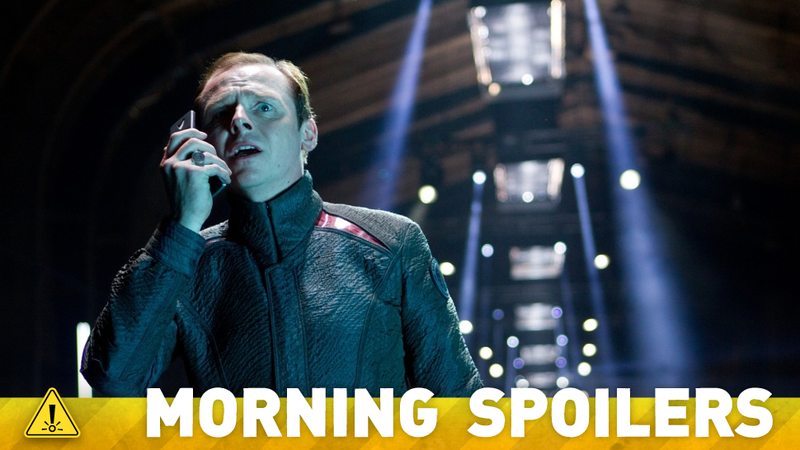 Plus, Agents Of SHIELD promotes an Inhuman to series regular, and teasers for Penny Dreadful. Spoilers! William Shatner is an amazing actor, and has such an incredible body of work which transcends his time as Captain Kirk. It’s always about whether the story’s right. It’s pointless crowbarring these things in as a gimmick. That does the story and the film a disservice. I have no doubt in my mind that [Shatner] could play Captain Kirk until the day he goes off to the final frontier. Would she be interested in coming back, then? “Yeah, of course! Are you kidding?” she said. As the Countess and her son move against two of John Alden’s valued allies, Mary suffers under the yoke of Puritan oppression stemming from an alliance between the Marburgs and another of Mary’s powerful enemies in Salem. But even as she seems to be at her most hopeless, Mary tries to take advantage of a widening schism between mother and son. As John and Cotton proceed with their monumental and unfamiliar task, each must process new information and gather strength to aid them in what lies ahead. Meanwhile, wracked with guilt and sorrow, a mournful Isaac pays a surprise visit to an already somber town gathering, Anne Hale finds the fate of many may rest in her novice – but powerful – Witch’s hands, and John and Cotton get the first glimpses of the enemy they are facing. Finally, TV Guide has exclusively revealed a new poster for the show. Additional reporting by Diana Biller and Charlie Jane Anders. Top image: Star Trek: Into Darkness.